Everyone expects Marlo to fly, but she would rather slither like a snake, hop like a kangaroo and swim like a crocodile. But when someone needs her help can she still rise to the challenge? 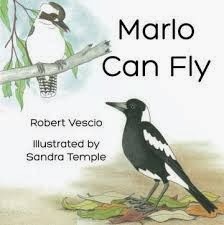 Marlo Can Fly By Robert Vescio is an early introduction into Australian animals and the way they move. Beautifully illustrated by Sandra Temple this book touched our emotions. The personality of the character shone through in each word and each illustration. In the short space available in a children’s book Robert Vescio has bought Marlo to life giving her a personality of her own. There are many hidden messages within Marlo Can Fly. The two that stood out most to myself was that of accepting oneself and finding who you truly are. Then there is that of standing up to a challenge and giving it a go, learning your strengths and weakness’ and your can and cant’s on the way. Marlo Can Fly is about friendship and fun times. The humour thrown in adds to the enjoyment of the book, providing a little bit of fun and giggles between the child and reader. Marlo Can Fly ends on a high feel good moment as Marlo achieves her challenge of flying in order to help Kev, a Koala who has lost his mum. Here we see the true Aussie spirit of lending a hand and helping a mate when he is down. This is a book that will be enjoyed by young and old. It is a feel good book I could read a million times. Sandra Temple has done a marvelous job with the illustrations. They are clear and precise replica’s of the animals, providing a visual that accommodates the descriptive words beautifully. I loved this book and can definitely say I have found another children’s author to add to the top of my list. Marlo Can Fly is targeted at the primary school child but I would have to say I disagree, this book has way more scope than that. As an early childhood educator I would have no problems reading this to a group of children within a child care centre or individual children from the age of 3 years. Although word lengthy on some pages Marlo Can Fly lends itself to being able to be shortened slightly for a younger audience, but I feel the pictures will captivate and hold attention so this would not be needed. Marlo Can Fly by Robert Vescio is a book I will remember and be recommending for a long time to come.